Two events have me thinking about cookies right now. Christmas is the obvious occasion. For me, Christmas isn’t Christmas without a tray of homemade goodies. Decorated cut out cookies with icing and lots of sprinkles always make an appearance on my cookie trays – both the trays I bring to Christmas gatherings and the ones I give as gifts. The other event is the fundraising auction our school holds each year. While the auction isn’t until spring, the auction committee is already at work collecting donations for the auction. 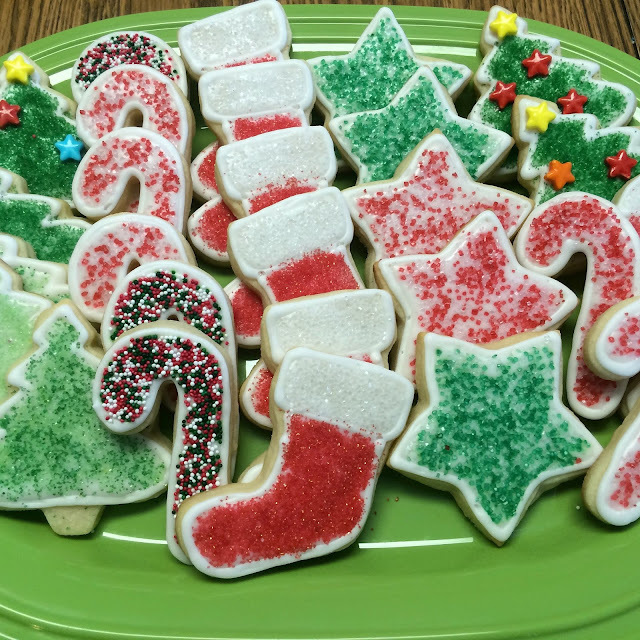 Last year, I donated a gift certificate for custom-made decorated cookies along with samples of each of the cookie flavors. The winning bidder got to choose from Raspberry-Cream Cheese Sugar Cookies, Chocolate-Hazelnut Cut Out Cookies (from Bridget Edwards' cookbook, Decorating Cookies), Peanut Butter Cut Out Cookies, and Oatmeal-Brown Sugar Cut Out Cookies (see recipe below). I haven’t decided whether I’ll donate decorated cookies this year or go with something like gift certificates for milk and my homemade Whole Wheat Chocolate Chip Cookies. But I do know that whatever I donate will be edible. Edible gifts are perfect in so many ways. Few things speak kindness more than homemade cookies or delicious treats. Plus, most people already have enough “stuff” so receiving (or bidding on) a consumable gift is often much preferred. For the several years now, we have given edible gifts to teachers, bus drivers, our mail lady, and others. A pound of Land O Lakes® Butter, a tub of Land O Lakes® Cinnamon Sugar Butter Spread, and a package of Land O Lakes® Co-Jack® Snack Cheese fit perfectly inside these assemble-at-home cardboard boxes. I add a handful of paper shreds to make it look festive and the kids decorate the outside of the box with markers or simply tuck a card inside. 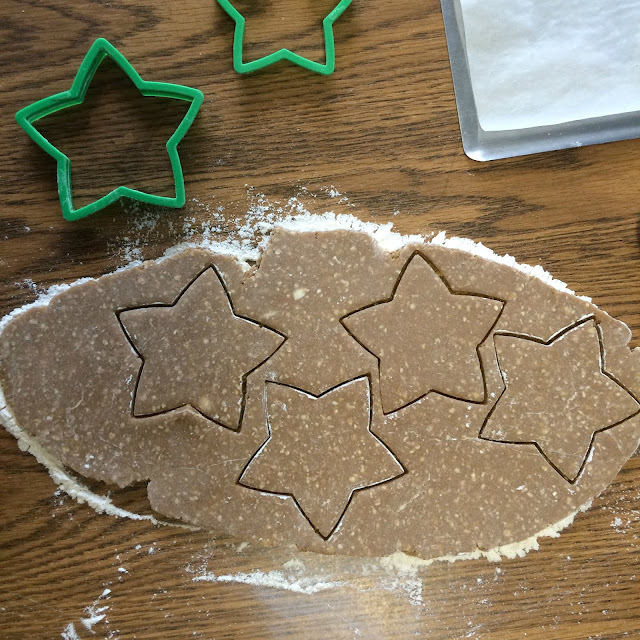 And, last, here’s the recipe for my Oatmeal-Brown Sugar Cut Out Cookies. If you like the combination of oatmeal and brown sugar as much as I do, you’ll love these out-of-the-ordinary cut out cookies. I was so excited when I first spotted a recipe for oatmeal cut out cookies while browsing a recipe site. Unfortunately, that recipe resulted in downright terrible cookies. My dog wouldn’t even eat them. I decided that the idea of an oatmeal cut out cookie was worth pursuing, so I fiddled around with the recipe and several tweaks later ended up with cookies that are definitely worth getting excited about. I outline my cookies with royal icing (using Bridget’s recipe from Bake at 350). Then I fill the cookies with vanilla-flavored Cookie Icing and top them with sprinkles. They would also be divine with cream cheese frosting. Cream butter and sugar together in large mixing bowl. Beat in egg, vanilla, and salt. In a separate bowl, whisk ground oatmeal, flour, cinnamon, and ginger together. Add dry ingredients to butter mixture in three parts and mix just until flour is completely incorporated. Divide dough into two pieces; shape each piece into a disc and wrap with plastic wrap. Refrigerate for at least an hour. *Note: You can prepare the dough for these cookies with cold butter, as well. Cut the butter into chunks before creaming with sugar using heavy-duty mixer. Reduce chilling time to 30 minutes. Preheat oven to 350°F. On a well-floured surface, roll one piece of dough out to ¼-inch thickness. Cut into desired shapes with cookie cutters. Place cookies 2 inches apart on an ungreased (or parchment-lined) cookie sheet. Place cookie sheet in the freezer for 10 minutes (this helps the cookies hold their shape while baking). Bake the cookies for 9 to 10 minutes or until they look done in the center. Let cool for 10 minutes on cookie sheet, then transfer to a rack to cool completely. I am a Land O'Lakes Cooperative farmer-owner. I received compensation from Land O'Lakes for this post. All opinions are my own. Land O Lakes and the Indian Maiden brandmark are registered trademarks of Land O’Lakes, Inc. The great thing about decorated cut out cookies is that the sky is the limit when it comes to creating new shapes and designs. I follow some incredible cookie decorators and they're always putting cookie cutters together to make new creations. I saw wreath cookies similar to these a couple years ago, made out of gingerbread and decorated with royal icing. They looked adorable but tasted horrible. No offense to the bakery that made them; I'm just not a fan of gingerbread or royal icing. So last year I decided to try recreating these with my Cream Cheese Sugar Cookies and Cookie Icing. I used this 8-petal flower from a cookie cutter set that had been my grandmother's. The miniature curvy hexagon (or whatever it is you call this shape) came from a set that I got as a gift from a friend. The two cookie cutters worked perfectly together. The bakery wreaths had a simple circle in the middle, which would work, too. But I really like the look with the curvy hexagon. I outlined with cookies with royal icing. 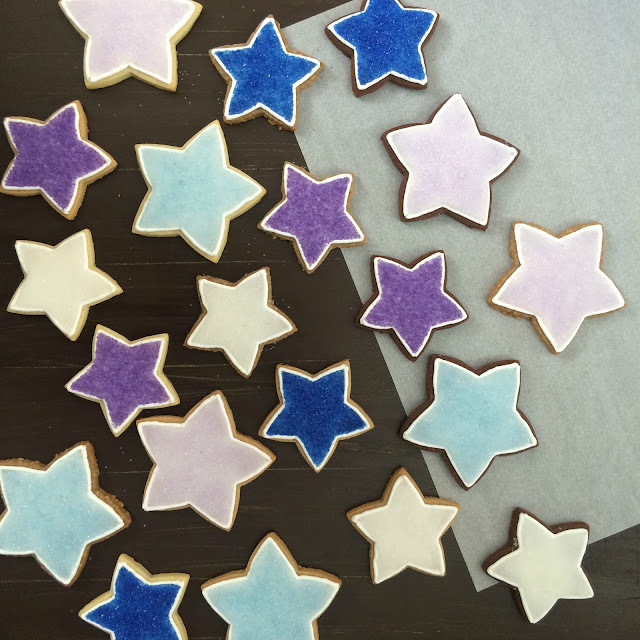 I often outline simple shapes with my Cookie Icing for Outlining, but for intricate shapes like stars and these wreaths, I find that royal icing works better and doesn't change the taste of the finished cookie. Then I filled the outlined cookies with Cookie Icing for Filling. If you're new to outlining and filling cookies, I highly recommend reading Bridget Edwards' cookbook, Decorating Cookies. She explains the process incredibly well. Once the cookies were filled, I placed red confetti circle sprinkles around the wreath and covered the rest of the cookie with green sugar sprinkles. Ta-da! Pretty Little Christmas Wreath Cookies. If I really wanted to get fancy, I could have added some red fondant bows or other decorations of the sort, but I like to keep things simple. Roll sugar cookie dough out into 1/4" thickness. 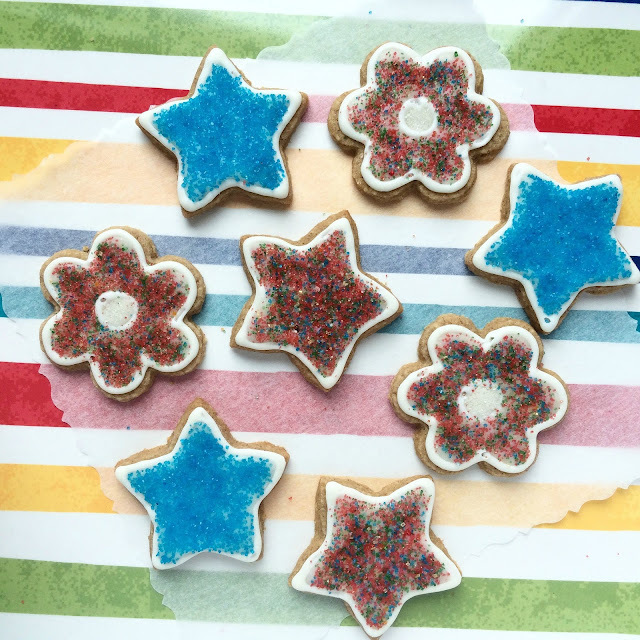 Using well-floured cookie cutters, cut flower shapes out of dough. Cut a curvy hexagon out of the center of each flower. Bake cookies according to recipe directions and allow to cool completely. Outline inside and outside of wreath cookies with royal icing, using the round tip. Fill royal icing outlines with cookie icing, spreading with toothpick as needed. While cookie icing is still wet, place red confetti sprinkles around the wreath. Immediately top rest of icing with green sugar sprinkles. Let icing dry for a couple hours before handling or packaging cookies. 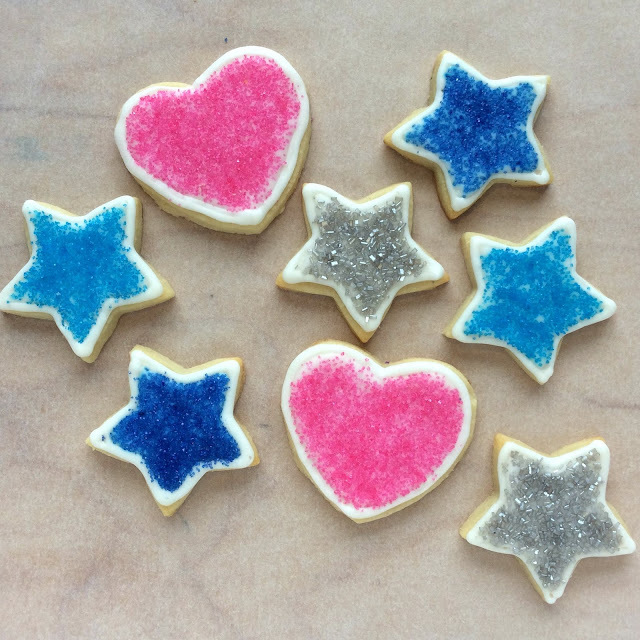 Make pretty decorated cookies without royal icing. I first came up with this icing recipe to frost my Christmas 2013 cookies. (You can read the story here.) 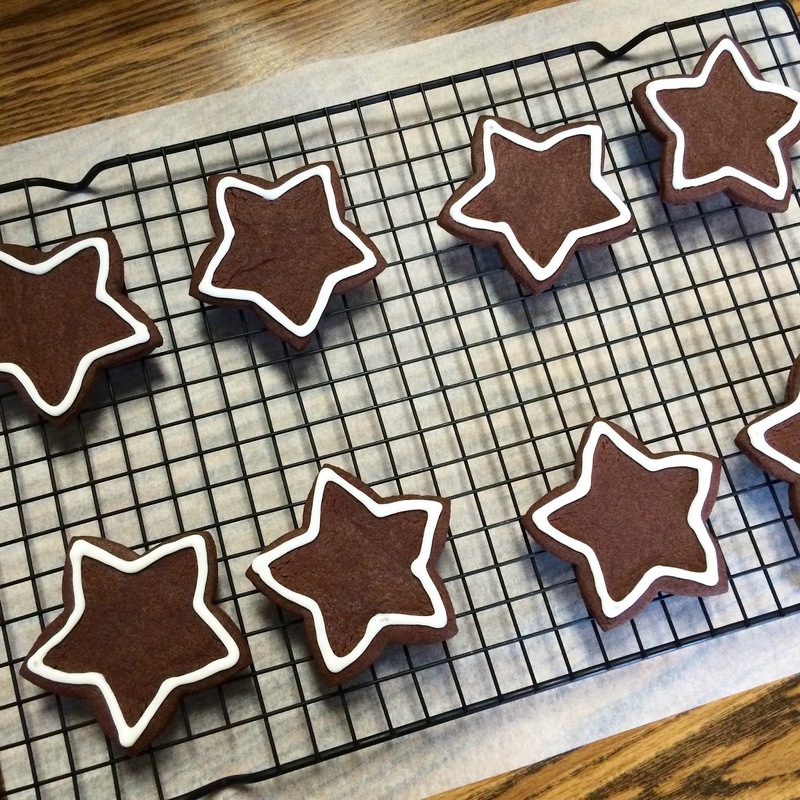 Three years later – and hundreds of cookies – I'm still using the same recipe, albeit with a few small tweaks along the way. This version is the best-tasting cookie icing I've ever come across – and it looks pretty darn good, too. Even better, the top of the icing dries enough to stack the cookies but the icing inside remains a little soft. When I first made this icing, I spread it on cookies with a knife. In 2014, after much inspiration from Bridget Edwards and her Decorating Cookies cookbook, I switched to piping an outline around the cookies, thinning the remaining icing just a little, and filling (or flooding) the outlines with the thinned icing before topping the icing with sprinkles. I should note here that I have never tried drying this icing on cookies without sprinkles. I usually use colored sugar sprinkles, but I've used nonpareils, too. I think the sprinkles help the icing harden enough to be handled and packaged. I personally love using sprinkles to add color to cookies because (1) it means I only have to make white icing and (2) it gives my kids a fun way to help with the cookies. Actually, this entire method of outlining, filling, and sprinkling is very kid-friendly. My kids have tried their hand at piping the outlines. It's a little tricky for them yet. But it's very easy for them to fill the cookies using a squeeze bottle and toothpick before adding the sprinkles. We even had friends over for a cookie decorating party with pre-outlined cookies. The kids filled the cookies and topped them with sprinkles. In 2015, I got a stand mixer for Christmas and tried making royal icing for the first time. 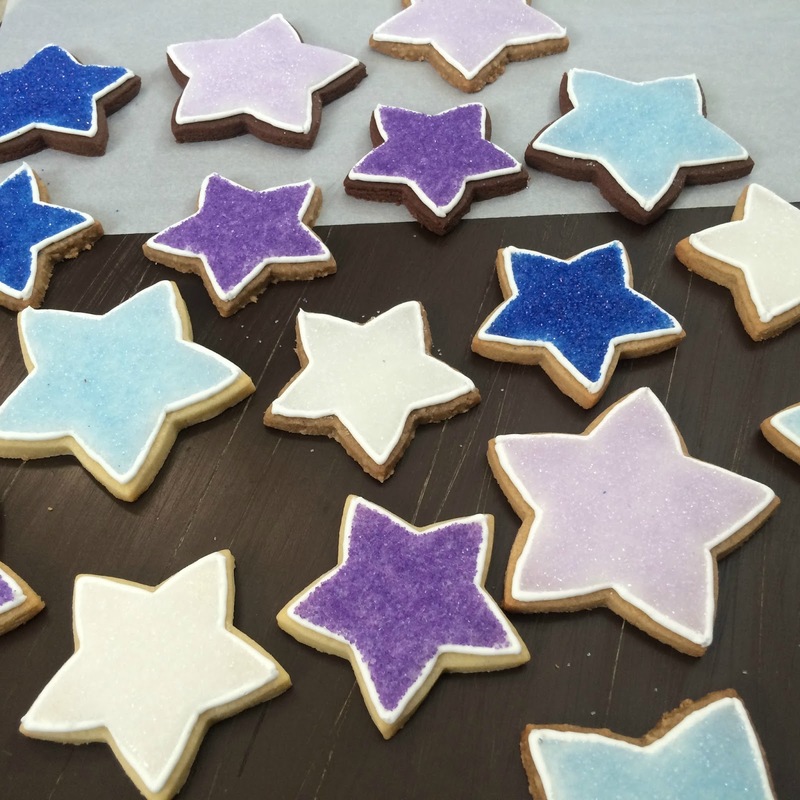 I'm still not a fan of the taste, but it does work extremely well for outlining cookies – especially intricate shapes like stars and wreaths. And a royal icing outline doesn't change the taste of the finished cookie. Combine all of the ingredients in a medium bowl and stir until completely blended. 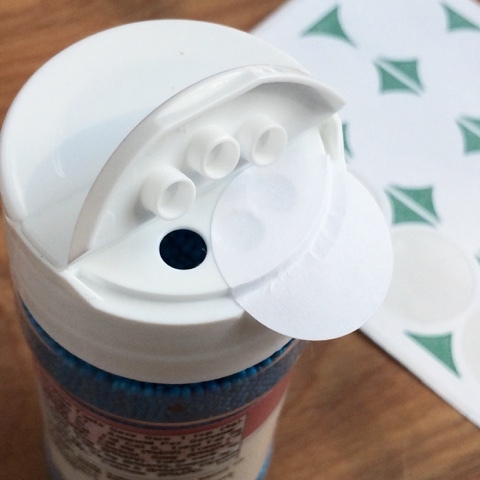 Transfer icing to squeeze bottle. 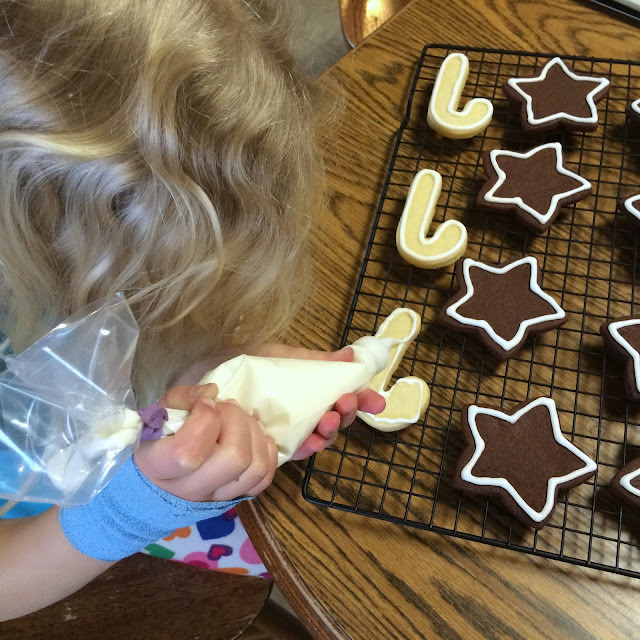 Fill outlined cookies, nudging icing up to the outline using a toothpick. Immediately top icing with sprinkles. Note: Cookie Icing for Filling also makes a delicious icing/frosting for cinnamon rolls, quick breads, bars, or any other treat that just tastes a little better with icing. These family-favorite bars have a chewy oatmeal cookie base topped with soft fudge filling and dappled with extra cookie dough. I didn’t know there was such a thing as Fudge Nut Bars until I met Glen. His mom, Doreen, always has a pan of bars or a bucket of cookies ready to share with family and friends. One time when we visited, that pan of bars was the most incredible combination of a chewy oatmeal cookie and soft fudge filling. After Glen and I were married, I asked Doreen for the recipe for her Fudge Nut Bars. She happily passed it along. I love these tried and true recipes, neatly scripted in ballpoint ink onto recipe cards. There’s something about holding the recipe card in your hand, admiring the penmanship, and remembering the baker or cook who took the time to record the ingredients and directions for a beloved treat or dish. The recipe for Fudge Nut Bars fills both sides of a small index card. These delicious bars start with a traditional oatmeal cookie crust, made delicious with Land O Lakes® Butter, brown sugar, vanilla, and rolled oats. After the dough for the crust is prepared, the fudge nut filling is made in a saucepan on the stove. Chocolate chips, sweetened condensed milk, and more butter are melted together before being united with chopped walnuts or pecans. While the filling cools, part of the oatmeal cookie dough is pressed into a bar pan. The rest of the cookie dough is saved for topping the bars. This can be rather sticky dough, so be sure to have some softened butter handy for buttering your fingers – it will make spreading the dough around a lot easier. I've also found that sticking the bowl of oatmeal cookie dough in the freezer for 10 minutes or so while you make the filling helps make the dough easier to work with. The oatmeal cookie dough is topped with the fudge nut filling and the remaining cookie dough. The easiest way to top the bars is to use your fingers to break off little pieces of cookie dough and drop them on the filling. The top cookie dough layer won’t completely cover the filling layer. The finished bars will have a sort of dappled look to them. Have I mentioned how delicious Fudge Nut Bars are? It’s like the flavors of an oatmeal chocolate chip cookie got together in a whole new way. They will quickly become a family favorite. Judging from how much my own kids like these bars, I’ll be sharing the recipe with them someday, too. Preheat oven to 350°F. Coat a 10 x 15 bar pan with nonstick cooking spray. Cream 1 cup butter and brown sugar together. Scraping down sides of bowl frequently, mix in eggs, 2 teaspoons vanilla, baking soda, and 1 teaspoon salt. Stir in flour until completely blended, then oats. Set oatmeal mixture aside or chill in freezer. In a small saucepan, melt 2 tablespoons butter over medium heat. Add condensed milk, chocolate chips, ½ teaspoon salt and 1 teaspoon vanilla. Stir constantly until all ingredients are melted together and filling is smooth. Remove from heat and stir in chopped nuts. With well-buttered fingers, press ⅔ of oatmeal mixture into prepared pan. Spread fudge filling over oatmeal mixture. Using your fingers, drop small chunks of the remaining oatmeal mixture over filling. Bake for 25 minutes. Bars are done when tops of oatmeal cookie chunks are golden brown. Let cool completely before cutting into bars+. With lights dimmed, spotlights shone on seven exceptional cows as they entered the Coliseum for the presentation of 2016 World Dairy Expo Supreme Champion. 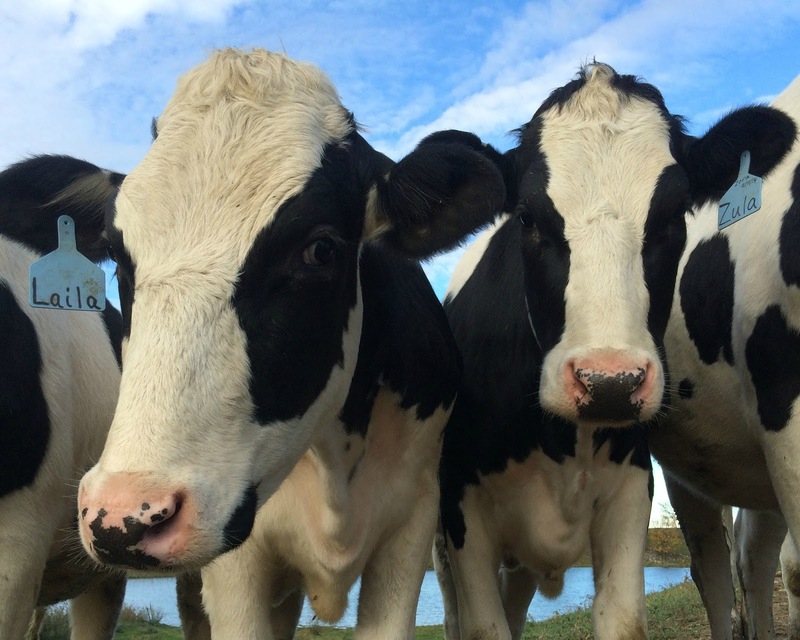 Each beautiful cow represented the best of its breed. Notably, six of the seven Grand Champions were bred and owned by their exhibitors. As the spotlights fell upon the Holstein, my heart tried to burst with pride and excitement. The Grand Champion Holstein was Sheeknoll Durham Arrow, a 6-year-old cow known affectionately as Thomas. Thomas’s owners, the Sheehan family of Minnesota, are friends of mine, and I’ve been following Thomas in the showring for years. Clearly, the rest of the dairy enthusiasts watching the Supreme Champion ceremony had similar feelings. The announcer was barely a dozen words into Thomas’s introduction when the applause started. Cheers and applause continued until Thomas took her place alongside the Grand Champions from the other six breeds. However, no other Grand Champion garnered the audible recognition that Thomas did. What was so endearing about this Holstein cow? Photo by Morgan Kliebenstein. Used with permission. Baby kittens are right up there at the top of the list of the best things about living on a dairy farm. Skunks are right down there at the bottom of the list of the worst things about living on a dairy farm. Last weekend, we had both. We got a preview of what was to come on Friday night when the eau de skunk wafted into the barn during evening milking. I always hate knowing that there’s a skunk around, but not knowing exactly where it is. I’m sure I looked more than a little paranoid as I carried the bottles out to the bull calves in the hutches. On Saturday night, the smell returned and so did the critter. I was in the house putting the kids to bed while Glen finished chores, so I missed all of the action. The only sign I had that anything was happening outside came from Ozzy, our Australian Shepherd. Anytime there’s something amiss outside, Ozzy will slip in through the front door the minute someone opens it. Ozzy is not a house dog by any means, so he is promptly escorted back outside. The kids would love to keep him inside, but his eau de barn is very strong and I’m afraid he’d quickly overheat in his ultra-shaggy coat. On Saturday night, Ozzy zoomed into the house and I had to drag him back outside by his collar. Then, as soon as I closed the storm door, he rounded and was scratching on the door like he was possessed. Ozzy is a 75-pound dog; I thought he might actually do some damage if he continued. So I let him back in the house. I grabbed the baby gate to quarantine him in the entryway. At least then the whole house wouldn’t smell like hot barn dog. When Glen got in, Ozzy’s demand for refuge in the house finally made sense. Glen said he was letting cows out when he had a feeling he should check the machine shed for the skunk. It’s unreal how often this sixth sense of his is right. "But when everything looks bleak, the bright spots shine brighter." To say that the past three weeks have tested my mettle would be an understatement. 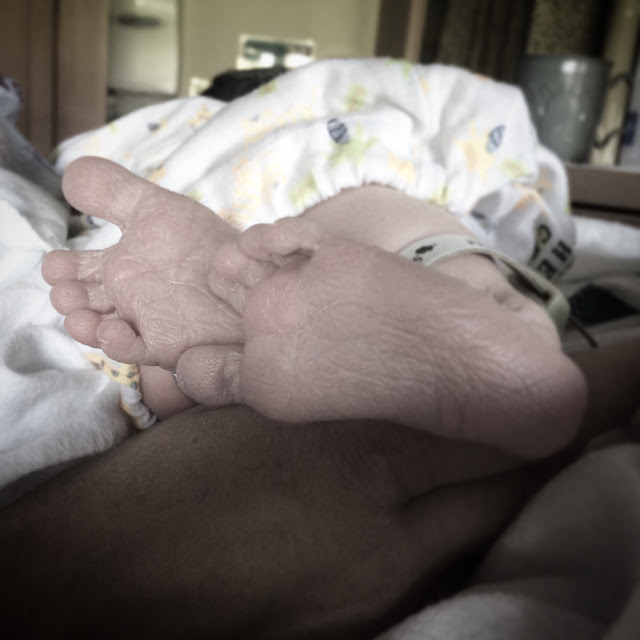 For the majority of those 21 days, at least one person in our family was unwell. First, Glen hurt his back and spent a considerable amount of time dressing Daphne's Barbies for her while lying on the living room floor. Then, something I ate left me with a severe case of food poisoning. Following that, each one of our kids battled one back-to-school virus or another. They had more sick days in the first three weeks of school than we had all of last year. Unwell family members really wear a mom down. More than once I wished I had a do-over for the month of September. On top of the physical challenges, it seems like every single news story I heard or read layered on mental and emotional anguish. I didn't sleep for three nights after the details of Jacob Wetterling's kidnapping and murder were reported. I'm still uneasy. I was eight years old when Jacob disappeared. His last school picture - on the back of our milk cartons - joined me for lunch more days than I can count. Like every other Minnesotan, the mystery haunted me. Solving the mystery still seems unreal. And now, as a mom, there's a heightened level of worry for my own children. An entire city block in our town caught fire last week, destroying historic buildings constructed by the town's founder back in 1887. The fire left families without homes and businesses without a place to do business. This was our town's second major fire in six months. Last March, our church burned at the hands of an arsonist. Then came the news of the stabbings at the shopping mall in St. Cloud. This was not like hearing about attacks in other places. I shop at that mall several times a year. As the story of the events unfolded, I could picture the scenes exactly. There was no need for imagination. Intermixed with all this are reports about our presidential candidates. I really don't think I need to say any more about the despair this causes. It's hard not to feel at times like the whole country - and maybe world - is going to hell in a handbasket. But when everything looks bleak, the bright spots shine brighter. I think that's why I was overcome with joy when my sister called to say that her water had broken. The rich dark chocolate flavor of Triple Chocolate Fudge Brownies pairs with peanut butter cups to make these delicious, adorable, bite-sized treats. 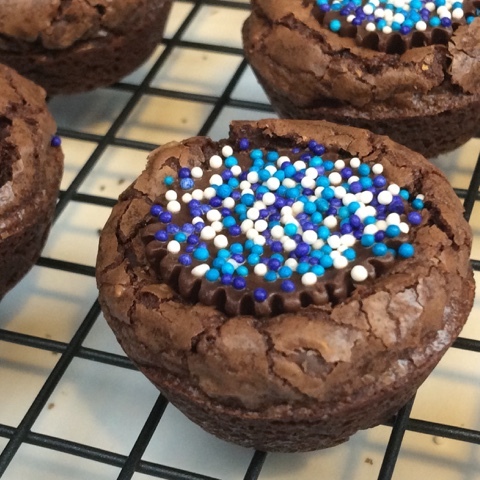 How do you turn classic brownies into delicious, adorable treats? Bake them up in mini muffin pans. Then add miniature peanut butter cups and sprinkles! 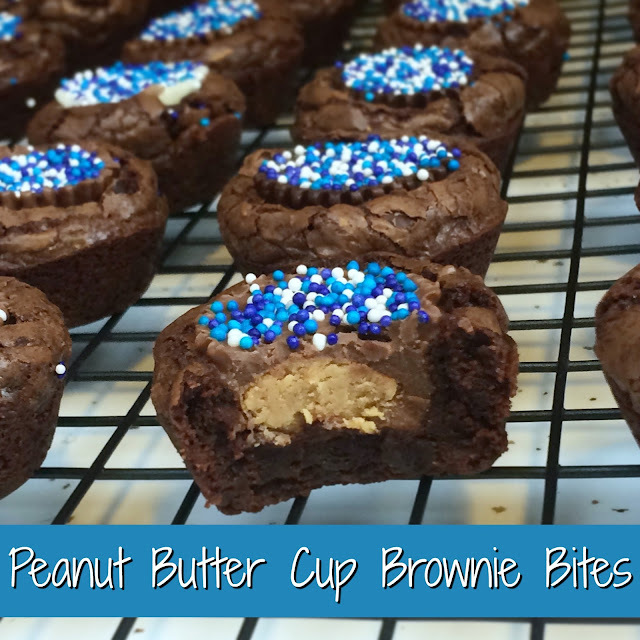 I first made these Peanut Butter Cup Brownie Bites for Christmas. They disappeared off my cookie tray before anything else. I quickly realized that brownie bites are the perfect treat for lots of occasions, because (1) everyone loves bite-sized treats, (2) the combination of rich chocolate brownies and peanut butter cups is irresistible, (3) they look fancy, but are really easy to make, (4) they’re easily customized for different events and holidays, and (5) they’re sturdy enough to hold up during travel and shipping. I try to bring treats to school a couple times a year to show teachers and staff a little appreciation for the work they do. Teachers and school staff have the important job of trying to make each student's education a good experience. The teachers and staff in our school do an incredible job of promoting a culture of kindness and respect. Delivering homemade treats to the teachers’ lounge is my way of saying thank you. 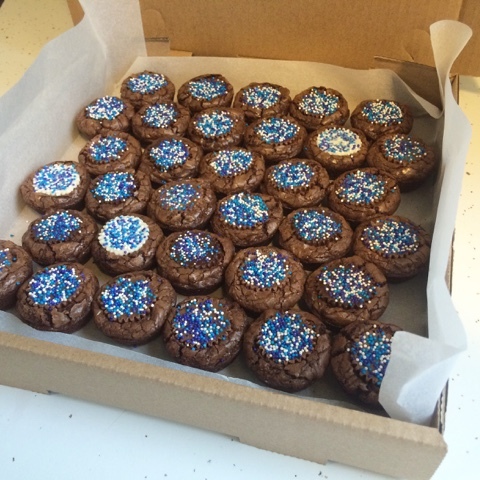 A couple weeks ago, I dropped off a box of back-to-school brownie bites. 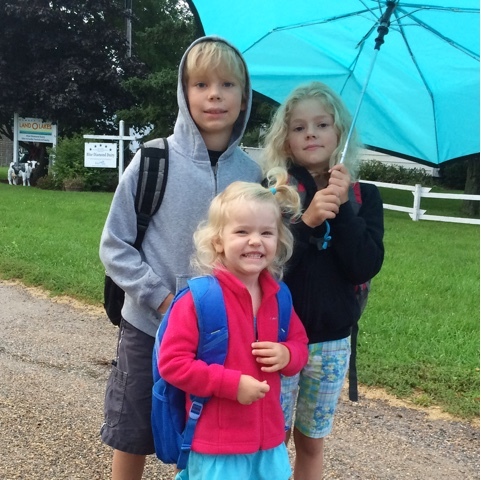 With Daphne starting pre-school this year, all three of my kids are now in school (at least part-time). Dan started fourth grade and Monika started second grade. I sent a box of brownie bites along for our bus driver, too. 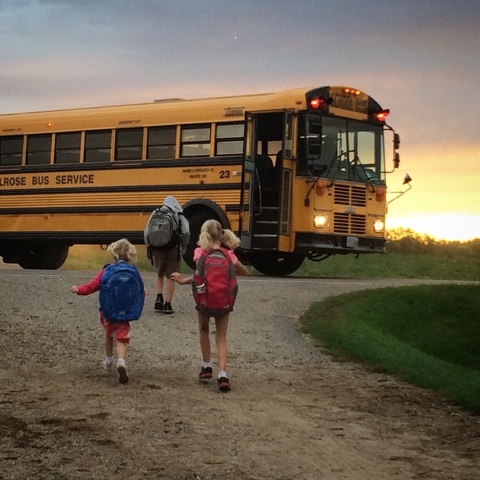 Bus drivers play a role in helping students have a good experience at school, as well. 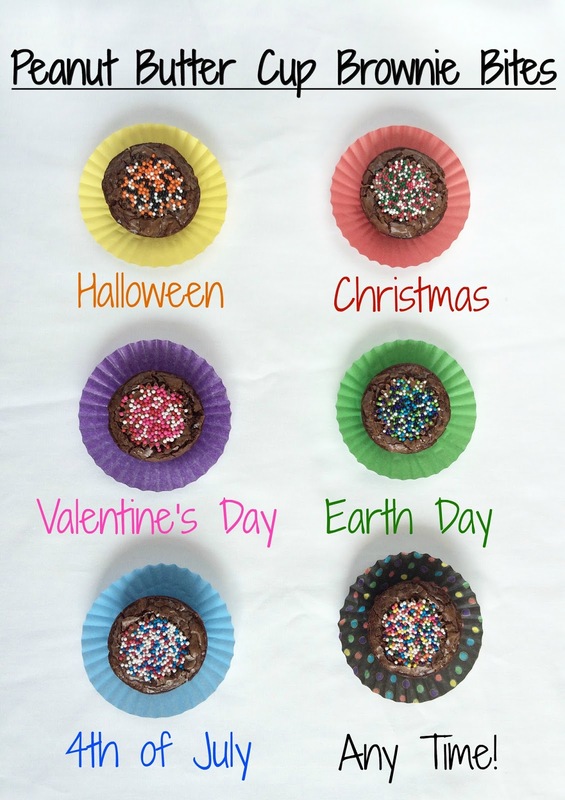 The kids helped me make the brownie bites for their teachers and bus driver. They mixed the batter and unwrapped the peanut butter cups. (Be sure to have extra peanut butter cups on hand if your kids help unwrap them – several will inevitably disappear.) It’s important for kids to know that teachers, school staff, and bus drivers are all appreciated. Peanut Butter Cup Brownie Bites start with my signature Triple Chocolate Fudge Brownies. These saucepan brownies are simple to make and you probably have all of the ingredients in your refrigerator and pantry. The brownie batter is baked in miniature muffin pans to make these adorable bite-sized brownies. 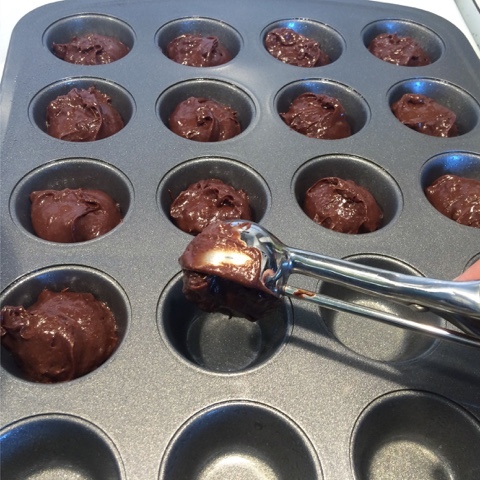 A one-tablespoon cookie scoop makes uniform-sized brownie bites. 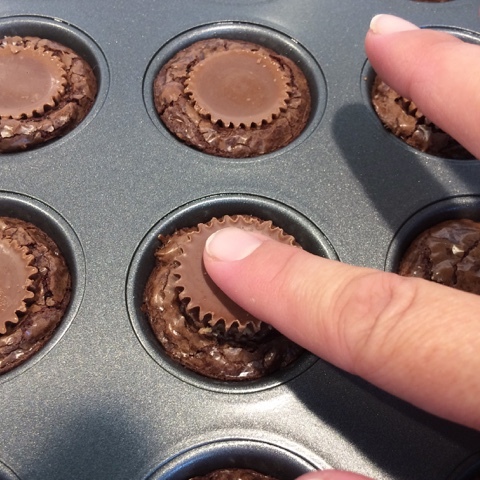 But adding miniature peanut butter cups takes these treats to a whole new level. 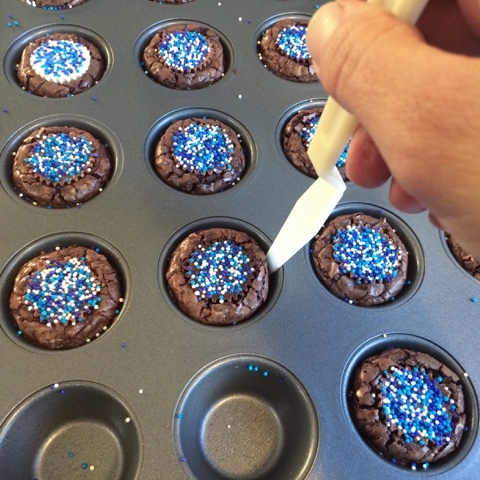 Last, top the brownie bites with nonpareil sprinkles to make them look festive and pretty. Sprinkles make everything seem a little more special. Hold off on gobbling them up right way. They should cool for a few minutes in the pan before you remove them. An offset plastic palette knife (the kind artists use for painting) is great for removing the brownie bites without damaging the treats or scratching the pan's nonstick coating. Spray a nonstick mini muffin pan with nonstick cooking spray, wiping excess from top of pan OR if using an aluminum pan, line pan with mini paper baking cups. In a medium (3-quart) stainless steel saucepan over medium heat, melt butter. Add ⅔ cup chocolate chips to melted butter, whisking until butter and chips are well combined. 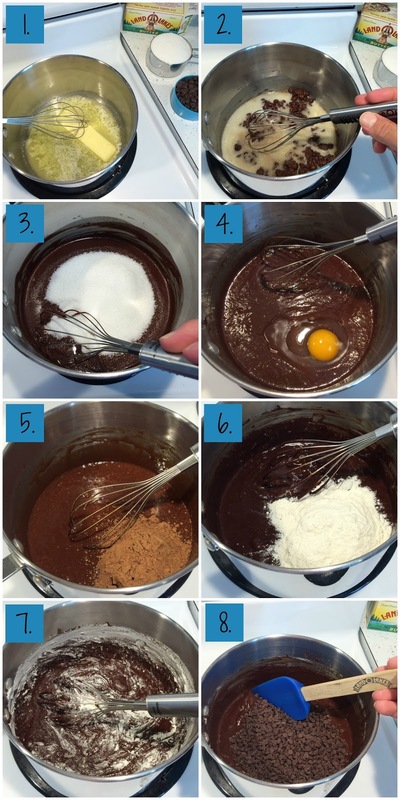 Whisk in, one at a time, until completely incorporated, the sugar, eggs, vanilla, salt, milk, cocoa powder, and flour. After flour is mixed in, whisk vigorously for an extra 30 seconds. Then, using a spoon or sturdy spatula, stir in 1 cup miniature chocolate chips. Remove brownie bites from oven and immediately press one unwrapped peanut butter cup into the center of each brownie bite. 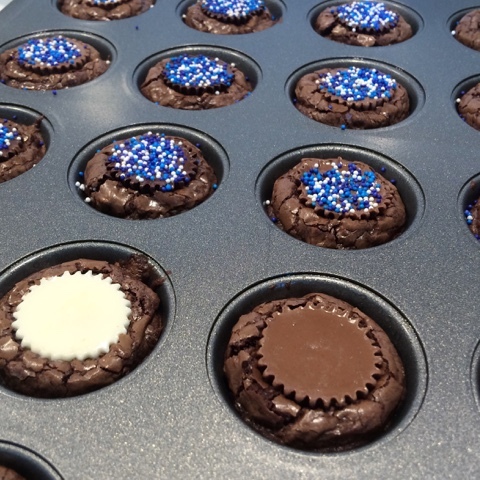 When the chocolate on the tops of the peanut butter cups has melted, sprinkle each brownie bite with nonpareils. 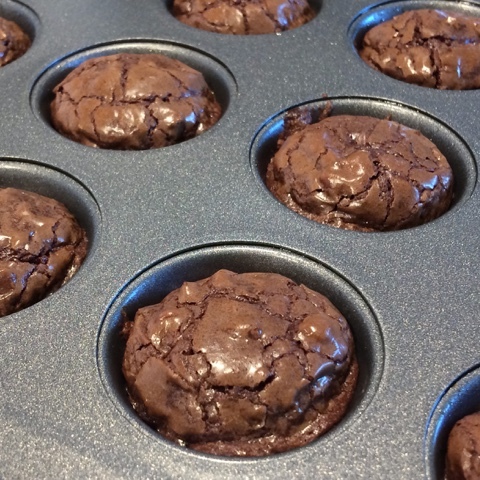 Let brownie bites cool in pan for at least 10 minutes before removing. Finish cooling on baking rack. Once cool, store at room temperature in covered container or freeze for later. • Making the batter in a stainless steel saucepan allows you to level the cookie scoop against the side of the pan without worrying about scratching a non-stick coating. 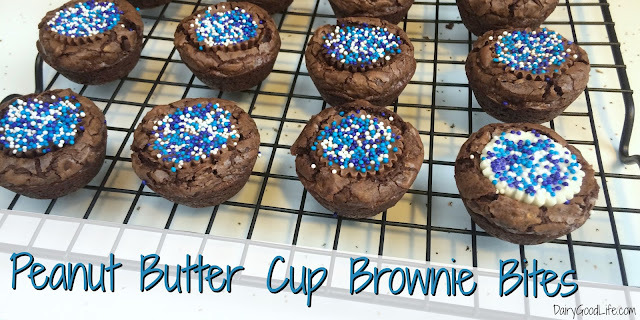 • Letting the brownie batter sit at room temperature for 15 – 30 minutes after mixing will make scooping the batter easier. • Check the capacity of your cookie scoops with a standard measuring spoon. (I scoop sugar to measure.) I have one scoop labeled #60 that holds 2 teaspoons; my other #60 scoop holds 1 tablespoon. 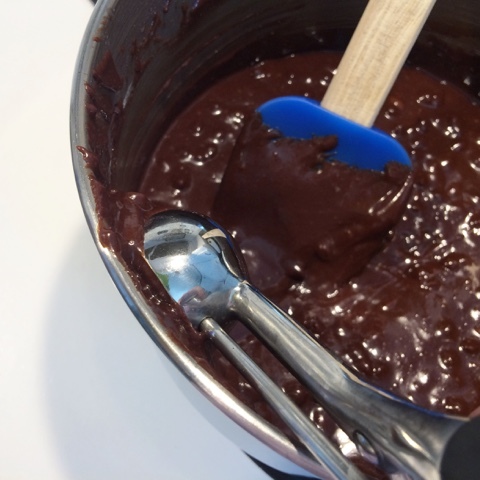 • An offset plastic palette knife (like the ones used by artists) is extremely handy for removing the finished brownie bites from the pan. • Avoid over-sprinkling the nonpareils by placing a sticker or piece of tape over all but one of the openings in the sprinkle jar lid. Then tap the jar lightly to sprinkle the nonpareils. Mix different colored nonpareils to match your event, party, or occasion. Adding white or light colored nonpareils to the mix helps the other colors really pop. If using a single color nonpareil or a blend without white nonpareils, using white chocolate miniature peanut butter cups will help the colors stand out more. What occasion will you make Peanut Butter Cup Brownie Bites for?